Can you believe it, Outlander fans? 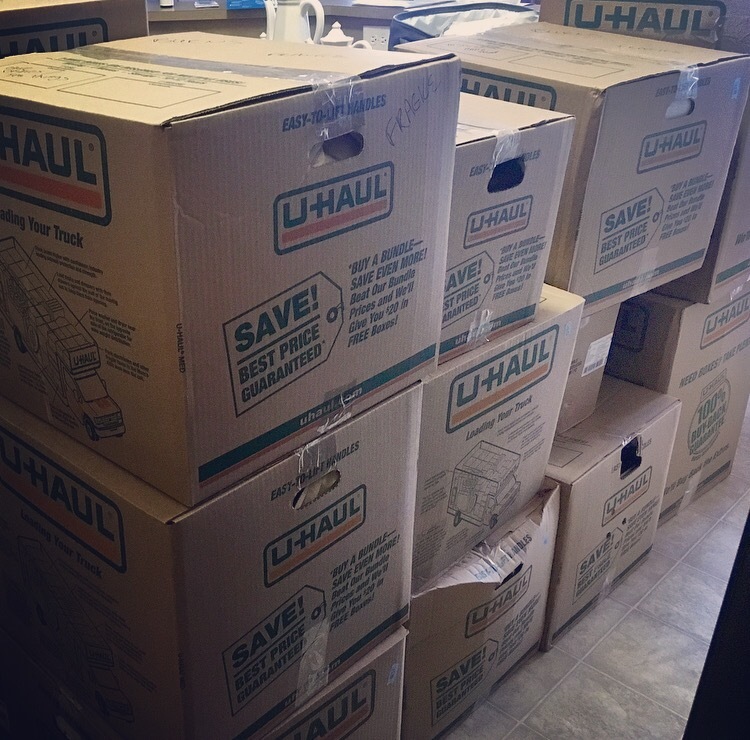 We’ve (almost) survived another droughtlander! The season three premiere is just a month away! We ken, Jamie. We ken. Earlier this year, I blogged about my experiences of cooking my way through the Outlander Kitchen cookbook. Thanks to chef Theresa Carle-Sanders, I’ve added so many Outlander-inspired dishes to my regular cooking lineup. Roger and Bree’s pizza! Stephen Bonnet’s salted pretzel balls! The MacKenzies’ Millionaire’s Shortbread! (Hands down one of my favorite recipes of all time. I get requests to make these bars constantly. And yes, sometimes the requests are coming from my own hungry tummy. In those cases especially, I’m happy to oblige.) Since writing that post, I’ve continued cooking my way through this marvelous cookbook, and I had every intention of posting about it sooner, but moving to a new state and having my kitchen look like this for a while was a bit problematic. In the words of JAMMF, you need not be scairt, because I’m back on track and ready to share my next round of culinary adventures with you. 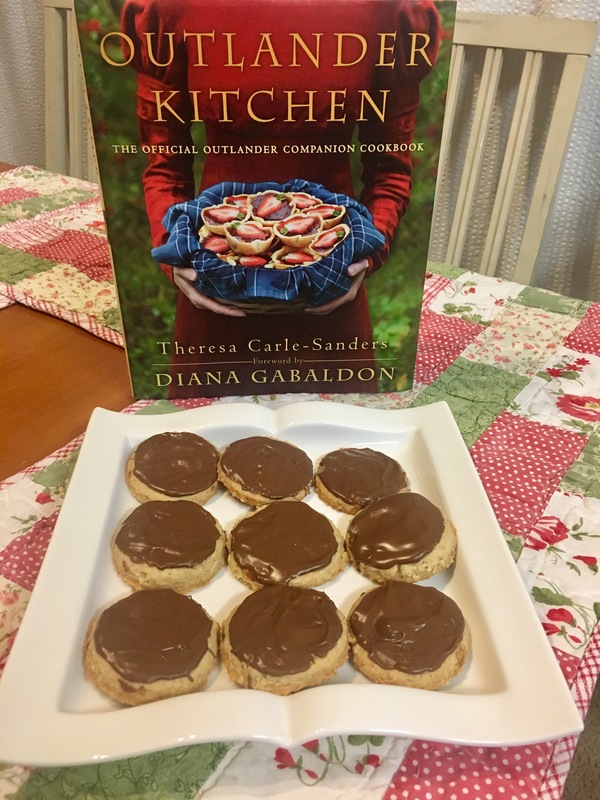 All of these recipes can be found in this must-have cookbook, and also be sure to visit outlanderkitchen.com for even more delicious goodness. Anyone who knows me knows that I can never turn down a cookie, so of course I couldn’t wait to try these ginger-nut biscuits. For the love of Murtaugh, they are supreme. They’re soft, chewy, melt right in your mouth, and have that perfect combination of ginger and cinnamon spice that will have you looking out the window and wondering if it’s fall. On top of all that, they couldn’t be easier to make, so if you’re, I don’t know, sitting around dreaming of Jamie Fraser’s ginger hair and suddenly get a craving for a ginger cookie (hypothetically), you can just whip these right up and go back to your daydreaming. 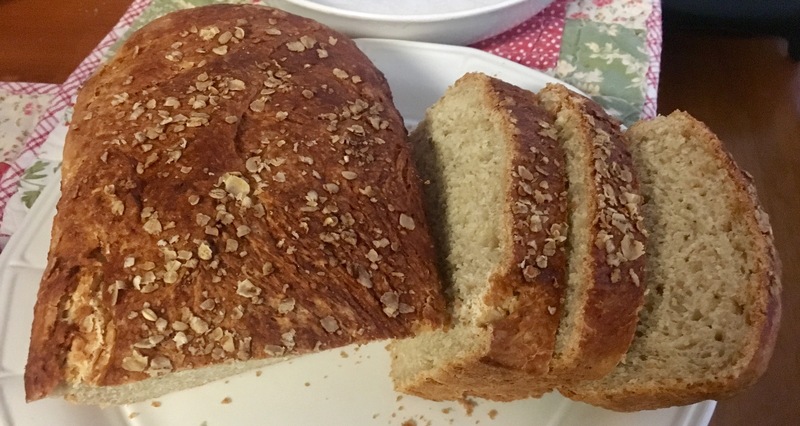 The recipe yields two loaves of bread, but it was easily cut in half to make one, which is all I needed and frankly all I was bold enough to try at the time. If it didn’t pan out (pun only slightly intended), I didn’t know what I’d do with two loaves of failed bread. Well. Actually, I think I know someone who would have happily taken one for the team. Bottom line: I made the bread, it was not so scary, and it was delicious, especially slathered in butter. (I never need an excuse to slather anything in butter.) I’m thinking of making myself some sort of “I BAKED BREAD, YOU CAN TOO!” badge. Thoughts? As opposed to the Scottish biscuits that we Americans call cookies, these are American biscuits that we Americans call, well, biscuits. Now that I’m living in North Carolina (heyyy, Fraser’s Ridge! ), I had to try my hand at some buttermilk biscuits. 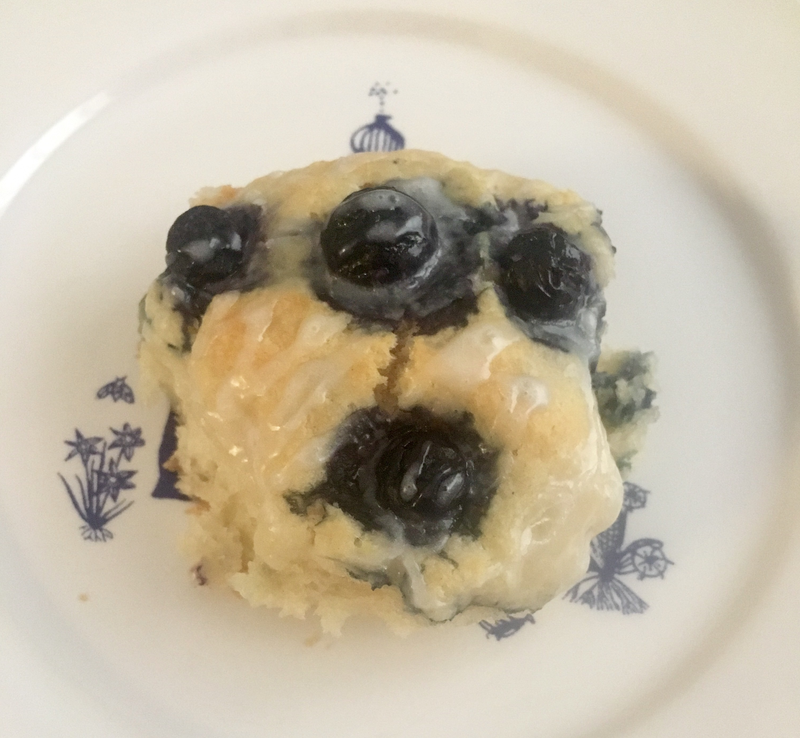 Because I love anything sweet, I made this blueberry-filled variation of Mrs. Bug’s Buttermilk Drop Biscuits. And, because I really love anything sweet, I added a glaze. (Forgive me, Mrs. Aberfeldy.) Oh, sweet Fergus, these might be one of my new favorite things. They’re good for breakfast. They’re good for tea time. They’re good for stuffing your face while re-reading The Fiery Cross. They’re just plain good, and easy peasy to make. 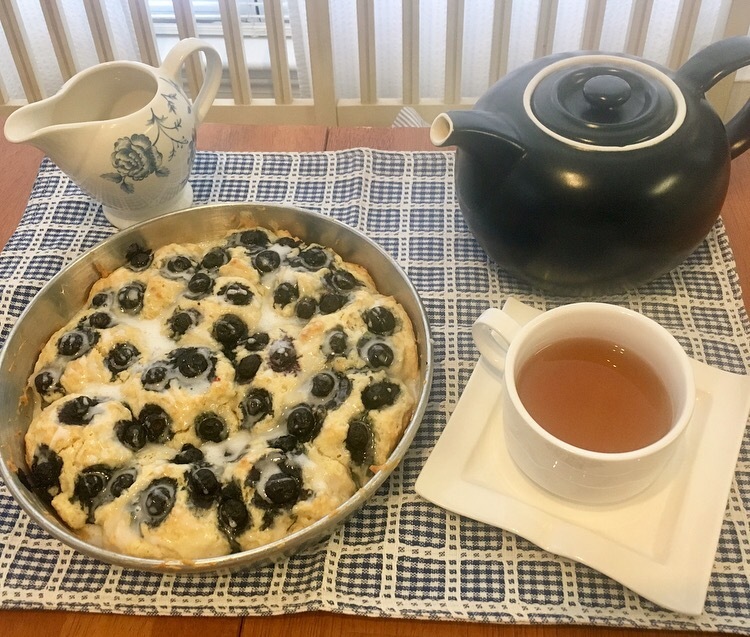 In case it hasn’t become clear, I love desserts, and as a new North Carolinian, I naturally had to bake up this pie named for Governor William Tryon. 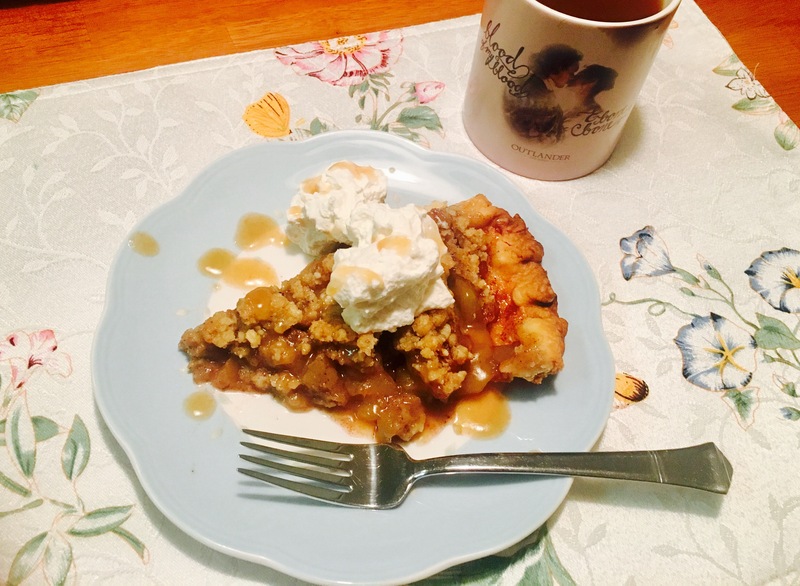 I love apples, I love crumb topping, and I love pie, and this was not only fun to make, it was so tasty that I had to keep going back for more. I also took the serving suggestion of drizzling the butterscotch sauce from Jem’s Bread Pudding over the top. WHY HAD I NEVER PUT BUTTERSCOTCH SAUCE ON APPLE PIE BEFORE? Life changing. Highly advised. If you thought this blog was going to be all about baking today, you’re wrong. I saved the best for last. 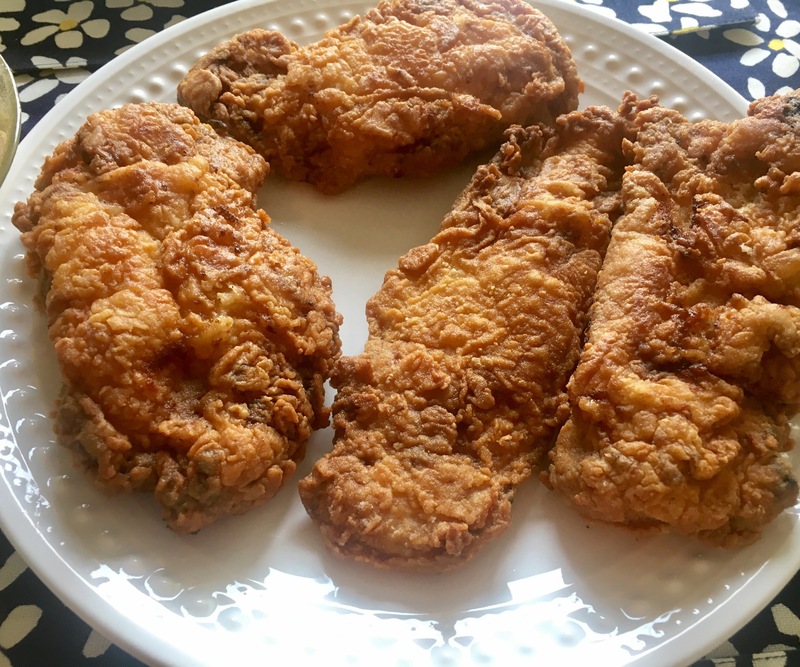 Sweet tea-brined fried chicken. Those are like all of my favorite words rolled into one dish. Aside from Italian chicken cutlets (which I’m genetically engineered to make), I’ve never really fried chicken. 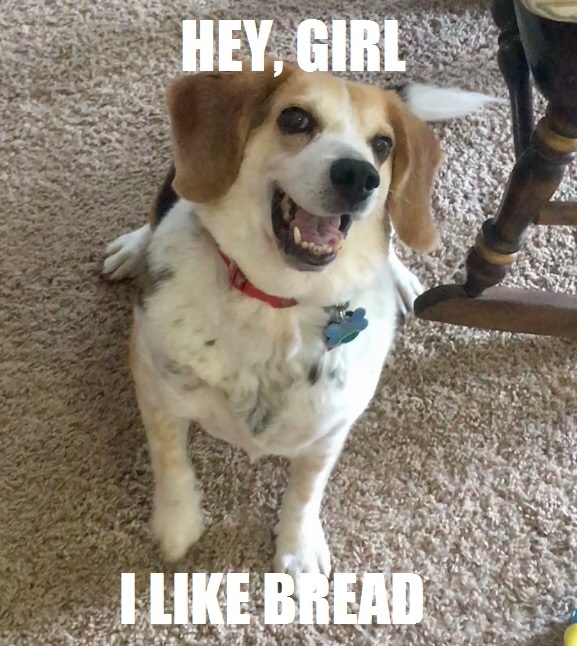 I love to eat it, but I’ve always stuck to oven-fried. Boy, has that changed. I feel like I’ve traveled through Craigh na dun and entered a whole new world that I never want to leave. Chicken (which I love) gets soaked overnight in tea (which I love) and then gets breaded (which I love) and FRIED. It’s sweet, it’s tasty, and when I brought it to a party, everyone thought for sure that it had been catered from somewhere. I’ve made it with boneless breasts (as in the cookbook), and I’ve also made it with wing sections. Both are delicious. There’s no turning back now. 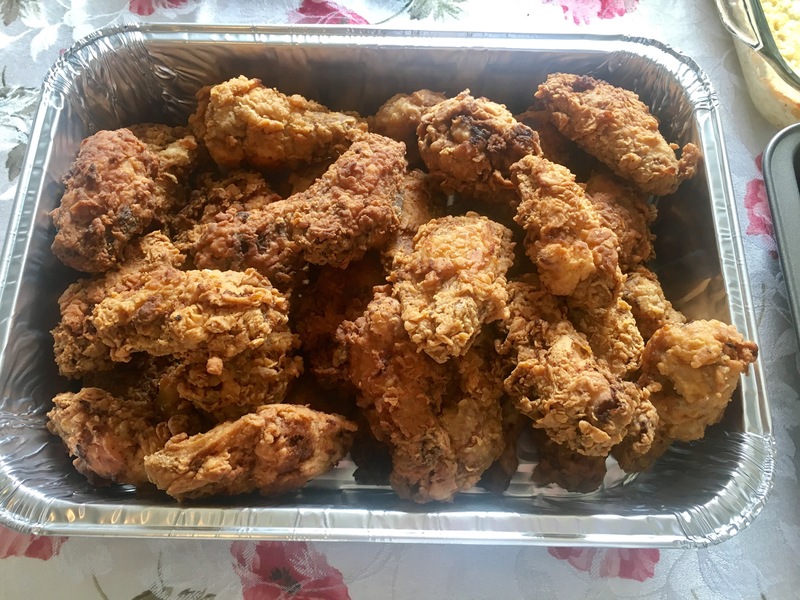 Invite me to your parties, I’ll bring the fried chicken, and everyone will have a great time. Well, that’s it for round two, obsessenachs! Tell me, have you tried any of the Outlander Kitchen recipes? Are you planning your season 3 premiere night menu? Are you re-reading Voyager with sweet tea-brined chicken on your fingers? 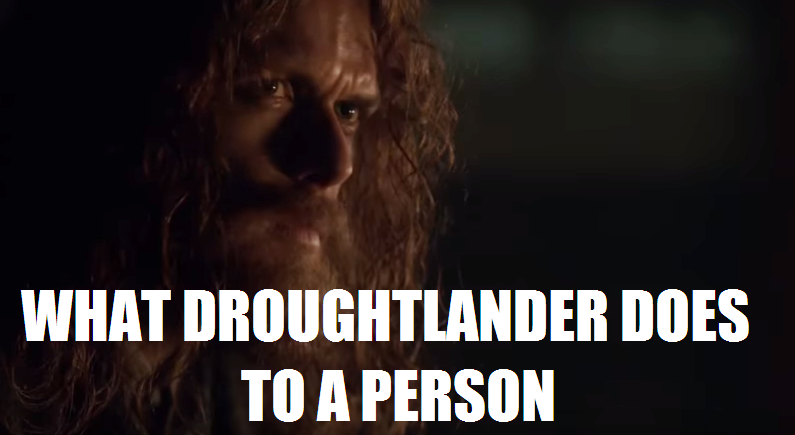 I’d love to hear how you’re spending these last weeks of droughtlander! And don’t forget to come back this fall for a full season of Outlander Superlatives! 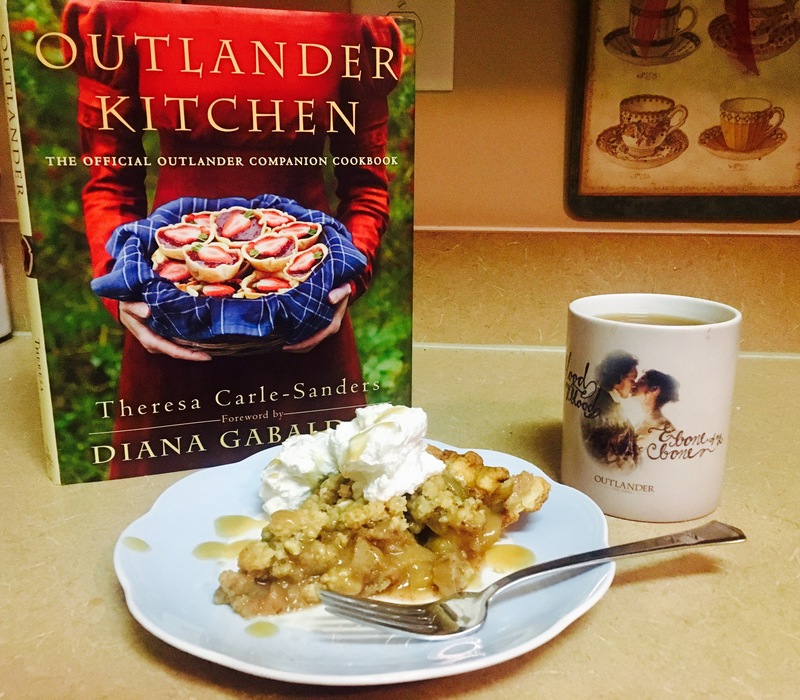 Be sure to visit outlanderkitchen.com for more delicious recipes and info on ordering this fabulous cookbook! 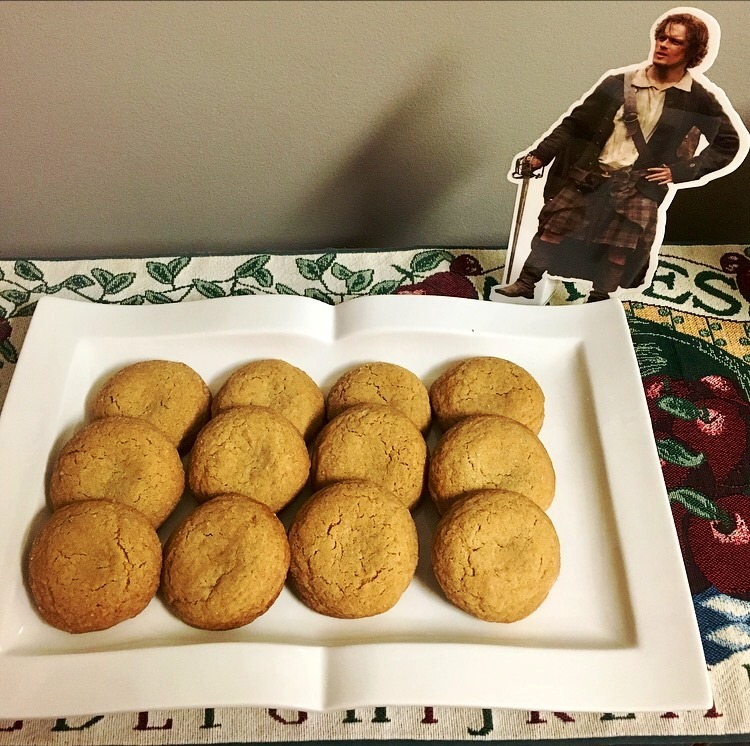 Also, don’t forget to follow Outlander Kitchen on Facebook, Twitter, and Instagram — and don’t forget your appetite!